Just when you thought boosting your Facebook post was a cheap and effective way to increase your engagement. I have some bad news for you, it’s potentially wasting you money. In this post I will explain what a ‘Boosted Post’ is and why you should avoid boosting your Facebook posts to promote your content on Facebook. A ‘Boosted Post’ is the upgraded version of a Promoted Post, which was launched back in 2012, but the essence of it is basically the same. It’s a quick way to get a previous post seen by a wider audience, and you can do it without leaving your Facebook page. I’ve noticed lots of Facebook page owners turning to Boosted Posts lately as organic reach has taken a nose dive. But because of Facebook’s constantly changing algorithms on Pages, it’s no longer worth the money. The first reason is because a boosted post will only ever optimise for more post engagement – more likes, shares, comments etc. What it wont do, is optimise for link clicks, which is what you need from your ad. You’ll often see a boosted posts get loads of likes, but only a fraction of those people with actually go to your site. By choosing your existing fans as your boosted post audience, you’re massively limiting your potential reach. You might get a few more post likes, but you’re not going to get more followers. The audience of Friends of Fans can have over a million people in it. Facebook doesn’t pick the most relevant people out of that bunch, your boosted post gets put in front of any of them whether they’ll be interested or not. This is where you can choose specific interests, location, gender and age. But the targeting choices are still very limited. You can’t choose an audience by behaviours, you’re limited to interests which relate to other Facebook pages. 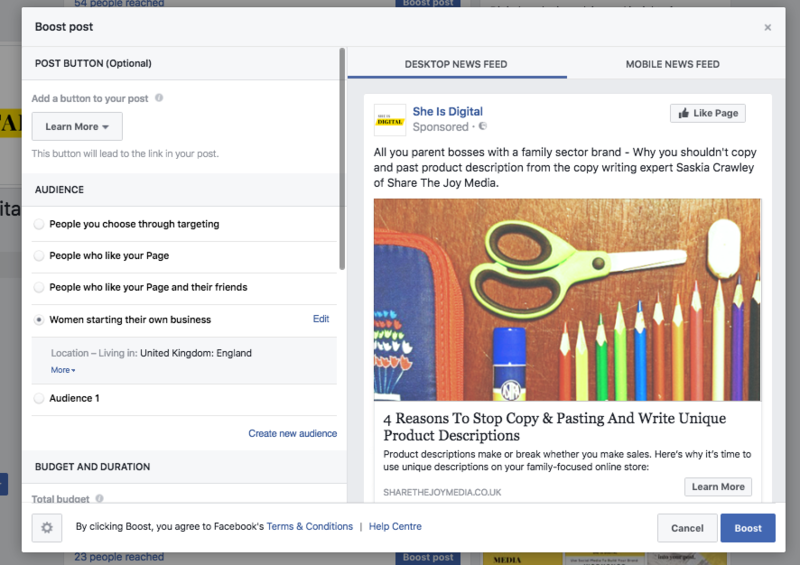 Plus, if you choose the targeting option, you can’t include or exclude your page fans. When you boost a posts, you can’t choose where you want that ad to appear. By default Facebook will show your ad on a mobile feed as it’s cheaper than a Desktop News Feed, whether it gets you leads or not. It’s worth knowing that Facebook does a lot of it’s optimisation automatically for you too. Their algorithms are designed to find the cheapest way to achieve the objective (more likes, share, comments), regardless of your over all campaign results. For example, if you selected both a male and female audience in multiple countries for your target audience, Facebook will push most of the budget to the demographic with the cheapest clicks, which could result in you missing a large proportion of your audience. Although, it seems like you’re making a targeted audience selection when you set up the boosted post, Facebook will just put your ad in front of the cheapest audience at that particular time, so it’s highly unlikely your ad is being seen by people who would actually convert. Still think boosting your posts is a good idea? Firstly, I would always recommend that you try to create effective and relevant posts that encourage interaction, are positive and motivational. People care more about stories and less about promotional content on Facebook, and ultimately Facebook’s goal is to serve these people with posts that are relevant to them. If you do go down the paid for rout, use the Facebook Ads Manager. It might take you a little bit longer, but you’ll be able to choose a more suitable campaign objective, select much more relevant target audiences, and have absolute control ever where your ad shows up. I’d love to hear how you’ve got on with Boosted Posts and whether you think they’re worth it.